Yesterday I rode my bike up to Port Townsend to check out my friend Bob Bryant's bike shop. Bob and I go way back. In the 1990s a broken collarbone brought me into the fascinating world of recumbent bicycles and I got to ride a number of very interesting bikes and meet a wide range of very interesting people. 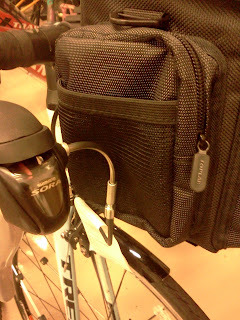 Bob and I immediately hit it off and I wound up writing a series of articles for his magazine, Recumbent Cyclist News. 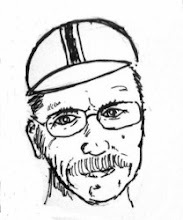 A few of these old articles still live on the web, including this portrait of Joe and the Joetator and this whimsical look at a somewhat different bicycle world. These days Bob runs an amazingly efficient little shop in Port Townsend that specializes in comfortable and simple transportation bikes. 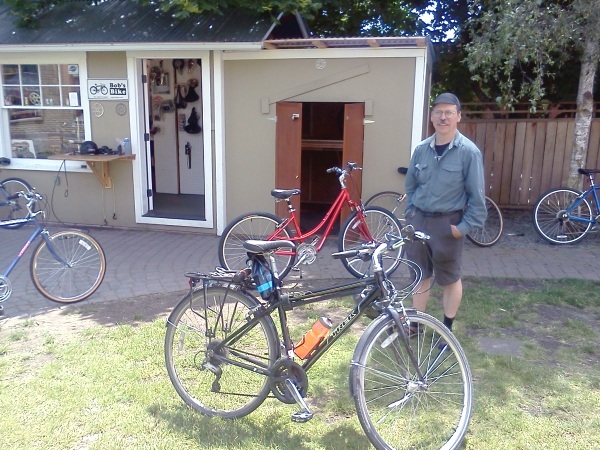 Operating out of a tiny shed that shares a courtyard with Coasties Custom Wheelbuilding, Bob is having a great time getting Port Townsend rolling on a mix of refurbished older bikes and inexpensive new cruisers. I picked a great sunny day to ride up and before Bob opened the shop for the day he bought me a coffee and scone at a nearby coffee shop while we solved the pressing problems of the word. My old randonneuring pal Jon Muellner (seen laughing maniacally in the summer sunshine) met up with us at the coffee shop and later insisted on buying me lunch. Over lunch Jon and I continued the work of solving the pressing problems of the world. We made some progress. It was a great day to be chatting with friends and I had great weather for the ride up and back to Port Townsend. As a final bonus, on the ride back south, I found this Craftsman 1/4" ratcheting wrench on the roadside. Some days are just wonderful. Good friends, good food, good conversation, good riding, and good fortune. Yesterday was one of the days when it was very, very easy to keep 'em rolling. This past week Christine and I spent our "virtual weekend" (Wednesday and Thursday) on a few acres of land next to the Raging River at a wonderful place called TreeHouse Point. This place is not far from our home in Issaquah, just over 8 miles as the bikes roll, and almost all of those miles traverse paths designated for non-motorized travel. Our trip was a true Sub-24-Hour-Overnight (S24O) and we didn't need to bring a tent or any camping gear because we had reservations in a small TreeHouse known as the Nest. We left home after lunch and we were settled into our Nest around 3:00 PM. At $150 for a single summer night, our stay at TreeHouse Point drained much of our entire fun fund for June, but we instantly knew this was money well-spent. The land is beautiful, the staff welcoming and the TreeHouses are cozy and amazing. Each TreeHouse is unique and they've all been designed by Peter Nelson, the man who literally wrote The Treehouse Book . Each of the overnight TreeHouses have electric light and heat while the main lodge and a central building called the Pond Room house the shared restrooms. The lodge also has rooms where folks can stay and it houses the central dining area. All of this was explained to us by a cheerful young woman named Rheanna, who thought it was really cool that we get around by bicycle. Rheanna told us where we could safely park our bikes, gave us a welcome packet including a small map of the land and informed us that fresh baked cookies would be available in the lodge at 4:00 PM. The Nest is the smallest of the overnight TreeHouses, and closest to the road, but Christine & I found it clean, cozy & comfortable. The bed takes up much of the space but there is also room for a couple of chairs and a storage chest. A tiny nook houses an electric tea kettle and a wonderful deck overlooks the Upper Pond and one of the other TreeHouses named, appropriately enough, Upper Pond. We spent much of our time exploring the grounds. Paths wind between the TreeHouses and lead down to the Raging River. There are numerous spots to just sit and think and wonder. There are nets in some trees which form chairs and platforms. While some of the TreeHouses are huge and quite luxurious, our favorite TreeHouse, the one which made Christine squeal with delight and say "Oh, I want one!" is a high perch known as the Hermitage, which is just big enough for a single chair, a small desk and an incredible view of the river. The stairs leading up to the Hermitage are counter-balanced with a rope & river rock mechanism that lets them pivot up for complete privacy. I think the TreeHouse Point people could make a fortune renting the Hermitage out as a writer's retreat. Since TreeHouse Point is basically a bed and breakfast, we knew we'd be on our own for dinner and we'd brought along a backpacking meal that we cooked up using the tea kettle. Christine and I are already plotting other TreeHouse trips. We know we'll be returning to TreeHouse Point, maybe in the off-season when the rates are lower and we can feel the storms shake the trees. Below are a couple of pictures of the bike I worked on today. 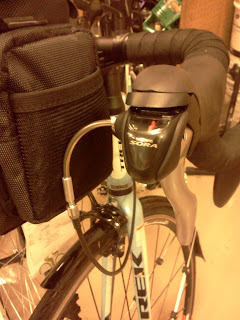 A couple of V-Brake noodles and a bit of cable trimming and the shifters are now peacefully coexisting with the big handlebar bag. 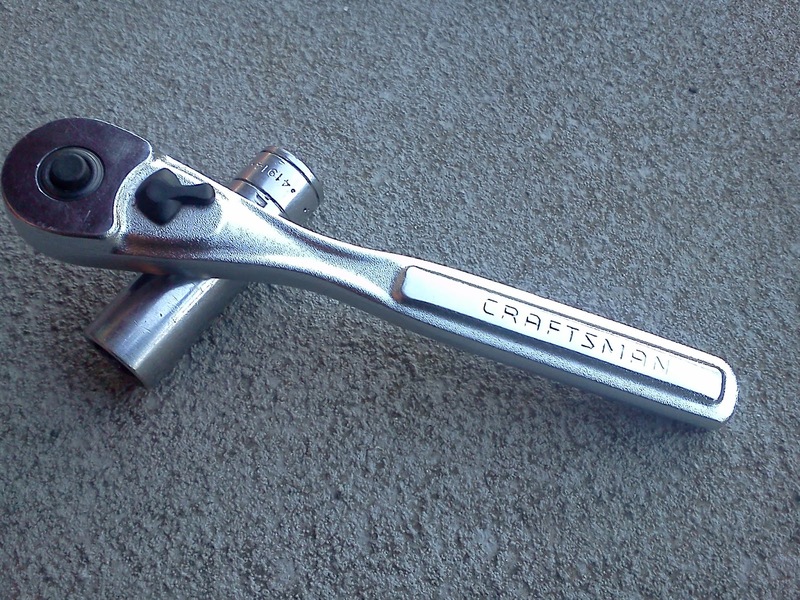 A couple of days ago Click and Clack, National Public Radio's Car Guys, announced that they are retiring. If anyone has earned the right to stop and smell the cappuccio it's those two greasy guys but with 25 years of call-in shows to draw from, their producers will be able to remix and recombine old car problems with Click and Clack laughing at their own jokes for many more years to come. Still, as someone who has spent about an hour each week yelling things like "vacuum leak!" or "bad tie-rod end!" at his radio, I'll miss them. And future generations will have to find somebody else to call when the flux capacitors blow out on their hoverboards. My son Eric has always found it odd that despite my general avoidance of automobile ownership, I am a faithful Car Talk listener. I like to point out that the weekly humor and tales of problems I don't have only strengthens my resolve to live car free. And through all the laughter, you can tell the Car Guys are pretty good mechanics. They listen to people's problems, ask good questions and often their answer is "bring it in to your mechanic." That's often the best advice. Diagnosing a mechanical problem over the phone is hard work. I know this because, perhaps under the influence of Click and Clack, I answer a lot of calls at the shop that begin with "My bike is making a sound..." Depending on how swamped we are at the shop with actual customers and actual bikes, I may engage the caller in a quick round of twenty-questions involvng queries like "is it a click or a creak?" or "does it happen every time the pedal turns or every time the wheel turns?" At least 90% of the time, the answer resolves to "bring it in and let me look at it." Clicks, creaks and clunks are symptoms of something wrong and shouldn't be ignored. I know folks can't always get to the shop and thus make calls to guys like me. And, of course, these days we have the internet. 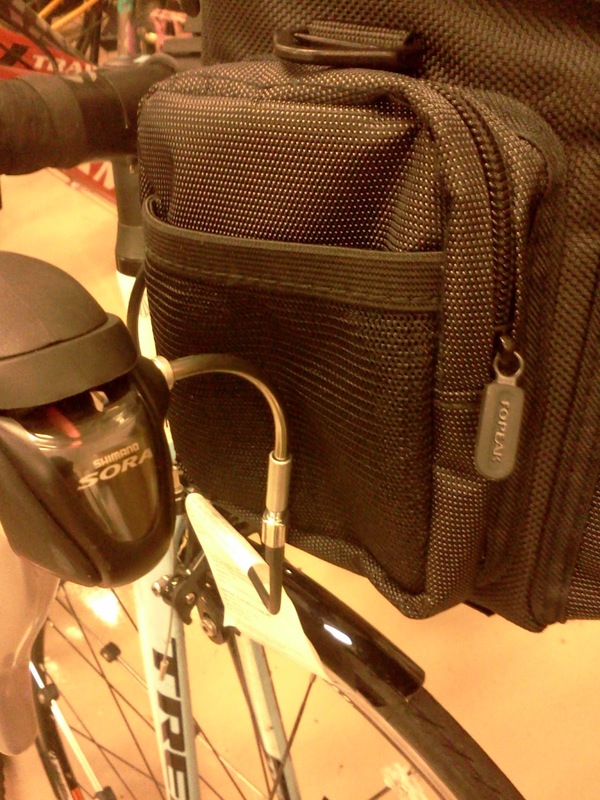 In preparing to write this blog post I sent a query out on Twitter asking folks for odd tales of noises and problems and got back terse tales of broken spokes, loose chainring bolts, ill-seated bottom-brackets, cracked seat rails, a crank hitting the kickstand and, my favorite, a metal drawstring tab from a sweatshirt tinking against a toptube. "Sheldon Brown bike making a sound"
Check it out, the page is another great example of Sheldon's brilliance. Sheldon was a genius and his genius lives on in all the web pages he lovingly crafted. Sheldon may be gone, but his helpful ghost lives on. And if you can't find your answer on the net or on the phone, remember your local shop has real people, with real tools who make their living by solving real problems. Xeni at BoingBoing also pointed out 4 minutes of great Bradbury footage that the people at JPL posted, Bradbury making some funny, self-deprecating remarks and reading his poem "If Only We Had Taller Been". If you ever doubt that Love is stronger than Death, look only to the work of Ray Bradbury or to the outpouring of love manifested at his passing. Death, Ray noted, is a lonely business. Anyone who writes will tell you that the actual writing is as well. But when you write, as Ray did, you find that you have shut yourself away not to be apart but to be a part. Part of this grand, wonderful, amazing world. Some build rockets to take others to the Moon or Mars and some build cities with words, cities on Mars, cities populated with Martians, dark they were and golden-eyed. And those words, built on dreams are the electricity in the body, the signal in the circuit, the ghost in the machine. These actions make the actors act. Some may say that Ray got the details wrong, that there are no canals, no dark skinned, golden-eyed citizens. We can't be bullied by such kids. When we go to Mars, or our robots do, and look around, we'll see the Martians in the mirror. Ray knows that will happen. I know it too. Ray dreamed that men and women were dreamers and doers and that doing makes the dreams. Ray made his dreams happen and showed us the way to make dreams happen. Ray hoped that when the dust cleared we'd see the Martians, holding a sign that saying "Bradbury Was Right." Ray was right. Mars is Heaven. So is Earth, when you hold your dream and get up every morning to build your rocket or type your story or do whatever it is you do in your race against Death. We hoped he'd live forever. And in his stories, he certainly will. And in the lives of all the countless people he's inspired to tell their own stories. He looked into darkness and light with wide-eyed wonder and delight and lived a life of amazing joy. Rest in peace, Ray. I will mourn his death a bit, it is hard to type through tears, but it is what you do. Here's a bit from one of Ray's books, Green Shadows, White Whale. It's about Ireland and bicycles and God's truth and a pity. "But," I said quietly, confused, "I've never heard of an accident like this in all my life. Are you sure there were absolutely no cars? Only these two men on their bikes? "Only?" Mike shouted. "Good God, man, a fellow working up a drizzling sweat can pump along at sixty kilometers. With a long downhill glide his bike hits ninety or ninety-five! So here they come, these two, no front or tail lights --"
"Isn't there a law against that?" "To hell with government interference! So here the two come, no lights, flying home from one town to the next. Thrashing like Sin Himself's at their behinds! Both going opposite ways but both on the same side of the road. Always the wrong side of the road, it's safer they say. But look on these lads, fair destroyed by all that official palaver. Why? Don't you see? One remembered it, but the other didn't! Better if the officials kept their mouths shut! For here the two be, dying." "Well, think on it, man! What stands between two able-bodied hell-bent fellas jumping along the path from Kilcock to Maynooth? Fog! Fog is all! Only fog keeps their skulls from bashing together. Why, look, when two chaps hit at a cross like that, it's like a strike in bowling alleys, tenpins flying! Bang! There go your friends, nine feet up, heads together like dear chums met, flailing the air, their bikes clenched like two tomcats. Then they fall down and just lay there, feeling around for the Dark Angel." "Oh, won't they? Why, last year alone in all the Free State no night passed some soul did not meet in fatal collision with another!" "You mean to say over three hundred Irish bicyclists die every year, hitting each other?" "God's truth and a pity." "I never ride my bike nights." Heeber Finn eyed the bodies. "I walk." "But still then the damn bikes run you down!" said Mike. "Awheel or afoot, some idiot's always panting up doom the other way. They'd sooner split you down the seam than wave hello. Oh, the brave men I've seen ruined or half ruined or worse, and headaches their lifetimes after." Mike trembled his eyelids shut. "You might almost think, mightn't you, that human beings was not made to handle such delicate instruments of power." Ray Bradbury never bothered to learn to drive an automobile. He saw what the car offered and said "no thank you." He lived an amazing, amazed life and made his way through the world (including many years in his beloved Los Angeles) by foot and by bicycle. And he changed the world by telling tales of amazement and wonder. His life reminds us what can be done by soul with a machine, be it a bicycle or a typewriter. 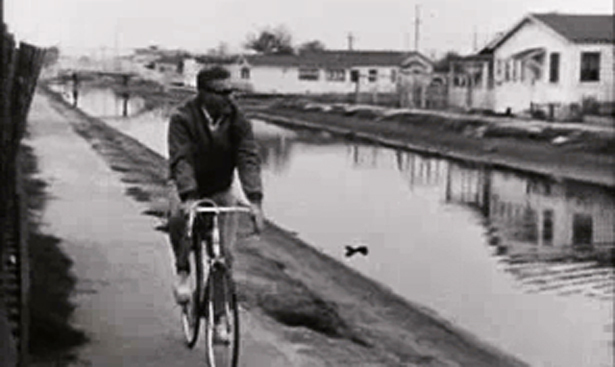 Bradbury described himself as being "drunk, and in charge of bicycle." He drank deep from life, was drunk on life, and wielded its power with astounding grace. Good bye, Ray. Thanks for all the stories. We're lucky to share in your drunken bicycle ride. As someone who is known as the Mountain Turtle, who has recommended books devoted entirely to snails, and who knows the pleasures of riding slowly, I find myself moved with admiration for Mike's well ridden ride and can only add my small voice to the chorus of congratulations he deserves for his remarkable effort. And to Peter Walker, the author of the opinion piece, I offer up my disagreement. I agree that great value and joy to be found in life by going slowly, but those who speed and push the limits can and do find joys in a world most of us will never experience. I've raced down the spine of the Rocky Mountains twice now, journeys set in motion long ago because John Stamstad once decided to race that distance. Routes can be toured or raced and neither activity diminishes the other. 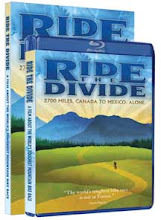 The attention drawn by races like the Tour Divide have drawn many more tourists to the Great Divide Mountain Bike Route. he travelled very, very light, with road bike and luggage together weighing in at around 16kg. It's amazing how little you find you need when you have to carry it. A lesson there for all of us, and not just in our sporting lives. Racers like Mike Hall extend the boundaries of what we think is possible. They solve problems most of us don't have and race to places we cannot go or didn't think to go. But they leave in their wake tracks and dreams and maps. Tracks and dreams and maps we may follow some day at our own pace. Or perhaps they become our own dreams of speeds and places not yet tracked. Fast or slow, it's a beautiful and amazing world. You may not need to race, but the world needs its racers.